It would seem that Tony Isaacson has done 'an about face'. Those who know Tony well would know of his position re wild animal feeding, but it would appear that he has now done an about face. 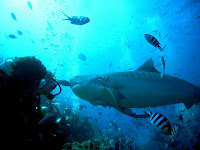 Given the desperate status of sharks at the global level, Tony made a decision to have direct influence on the best shark feeding dive that he knows, at Beqa Lagoon in Fiji. That is where he will be training this year to become one of the shark wranglers. "I know that it will be an honour and privilege to work with these free-ranging survivors of the Pacific. We know that the tigers visit the Great Barrier Reef and at least one of the bull sharks has made it to Darwin. Many of them have scars or hooks to remind divers just how lucky they are to be witness to their continued return to Beqa Lagoon. This, & other of Tony's photos can be viewed at http://picasaweb.google.com.au/stevereynolds600/TonySPhotos.